Expense management keeps small businesses efficient and focused. The number one thing small businesses need more of? Time. Small businesses also don’t want to waste a lot of time shopping around for new software. Get it implemented and get on to actually executing your business plan. 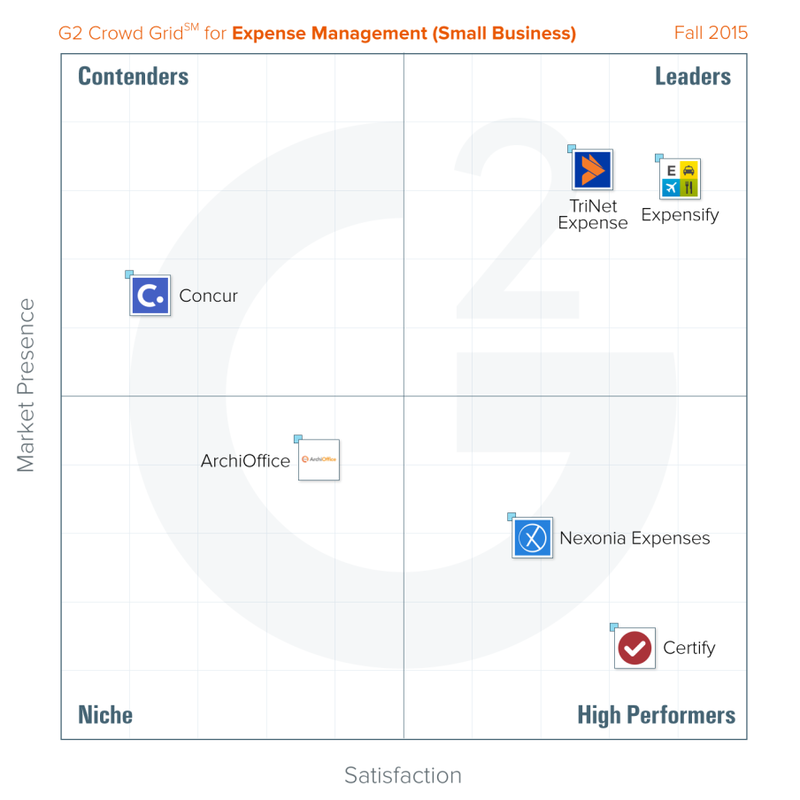 So, G2 Crowd has identified which expense management products small businesses use and love. Presenting the G2 Crowd Expense Management GridSM for Small Business, this comparison tool only takes into account reviews from companies of 50 employees or less. It specifically shows small business users’ satisfaction with the tools they use and the market presence or prevalence of that product among small businesses. Of the 16 products that appear on our overall Expense Management GridSM, only 6 received enough reviews to be evaluated on the G2 Crowd Expense Management GridSM for Small Business. These are listed below with their respective customer satisfaction score (normalized). Leaders Expensify and TriNet are Leaders on the overall Expense GridSM as well, but achieve a much higher market presence among small businesses. Concur’s satisfaction score and Certify’s market presence fall dramatically when looking only at small business reviews. Each moves from a Leader to a Contender or High Performer respectively. Nexonia Expense remains a High Performer among small businesses as it is overall. For more information, compare expense management products on G2 Crowd or purchase our in-depth expense management research package.